THE BEST WALK IN INTERVIEW IN MUMBAI FOR GULF JOBS. 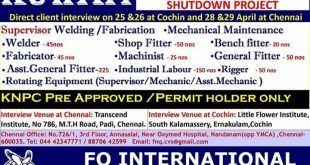 WALK IN INTERVIEW IS POSTED FOR ENGINEERING GRADUATES AND EXPERIENCE ENGINEERS , HOTEL MANAGEMENT, DRIVERS, WELDERS AND SALES PROFESSIONALS VACANCIES FOR FOREMAN, SUPERVISORS,A C TECHNICIAN, MEDICAL GASSES TECH. 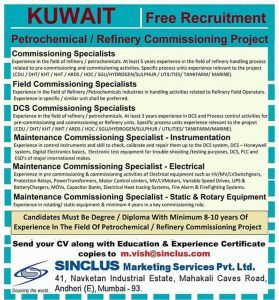 URGENTLY REQUIRED FOR A LEADING CONSTRUCTION CO. APPLY FOR THE GIVEN MAIL ID. 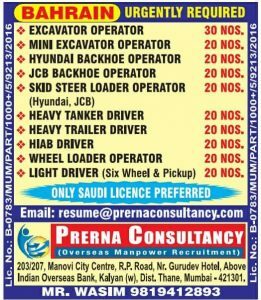 best gulf jobs in mumbai. sir i ve completed my btech in mechanical and having 5years exp in CNC programming/setting/operating with 2D/3D programming. if u ve vscancies plZ reply me by my email address. I am Mbwana Hamza Hassan from mombasa kenya.befour i work in qatar for tow year experince with qatar license& in kenya i have ten years experince with kenya license, so i seeking a trailor job in qatar agen. i have 6 years experience as a safety officer &3 years as a construction Supervisor in Dubai, i seeking job in Kuwait or Saudi or Bahrain. I’m looking for a job overseas. I have an experience of 5 years in selling Material handling equipment like Cranes (EOT / HOT / JIB , Chain pulley block , Chain Electric Hoist , Wire Rope Hoists etc. I am Sameer Bhor. I have done MBA in Marketing and having a 7 years experience of Automobile Sales. 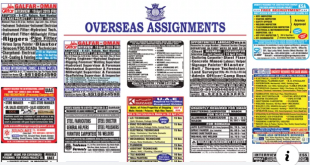 I am looking for overseas job in Sales if there is any vacancy for sales please do the needful. Having 20 years of working experience in middle east in Logistics, Warehousing,Stores and Inventory Control in construction sector. 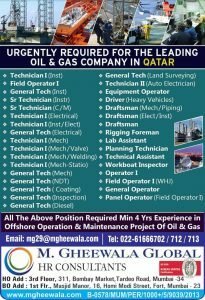 Recently I have left a company based in Qatar and lookin for new opportunity. Sir, I am Alok kumar as a pipe fitter 5years experience in india and I year experience in Kuwait please inform me for right job my contact no 9304094550.